Gonzalo Pérez de Vargas was born in Toledo on 10 January 1991. His first encounters with the sport were in his hometown, where he played fro 1998 to 2007 for Amibal. His ability in goal did not go unnoticed by Barça’s scouting team, who signed the player for the youth system in the 2007/08 season. Pérez de Vargas was brought in by Xavi Pascual, who now coaches the first team and was responsible for developing the talents of players such as Saubich and Ariño. That same season, Pérez de Vargas participated in training sessions and friendlies with the first team. In the 2009/10 season he made his official debut for the first team on September 19 against BM Toledo at the Palau Blaugrana. During the 2011/12 season he continued to participate in first team training sessions, but spent the majority of the year defending the reserve team’s goal. He was loaned out to BM Granollers. He spent two seasons with his new team and was then loaned to Fenix Toulouse in the 2013/14 season. His performances in goal earned him a spot on the Spanish national team. He was named the best young player of the French League in 2013/14 thanks to his 41.30 saving rate and a total number of 299 saves. 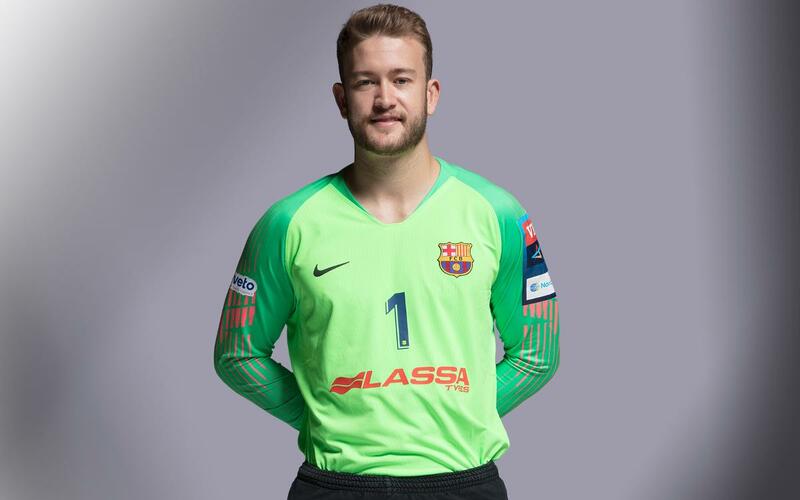 The keeper returned to FC Barcelona in the summer of 2014 and his excellent performances, coupled with the departure of Arpad Sterbik, allowed him place in a squad that would go on to win all seven trophies possible in the unforgettable 2014/15 season. Gonzalo Pérez de Vargas is a player born to be a keeper. Considered one of the young keepers with the most potential in Europe, the Toledo-born man brings security and quick reflexes to the court. Pérez de Vargas is known for being able to deal with long-range shots, shots from the 7-meter mark, and his consistency make him an excellent addition to the FC Barcelona squad. Barça Lassa 34-18 Liberbank Cuenca: Copa del Rey champions! Montpeller HB 28 – 36 Barça Lassa: Straight to the Champions League quarterfinals!